“Everything matters.” So spoke multiple Grammy-Award winning recording engineer Leslie Ann Jones, in between sessions at Skywalker Sound. While working on the Cypress String Quartet’s final recording, things just weren’t sounding the same as they had the day prior, and it was a mystery as to why. The players and equipment were identical. Skywalker’s adjustable acoustic system – where the room itself can be tuned for more or less reverb – hadn’t been touched. The players themselves were in the same exact positions, as precisely marked with tape on the floor. Still, something was off. Eventually, a surprising discovery was made. The chairs used by the performers had been swapped out that night, for whatever reason, and replaced with identical models from the same batch. One chair was discovered to have a different angle to it – likely being bent due to regular use – which changed the posture of that particular performer, and thus the relationship of their instrument relative to that of other players. We’re talking mere inches here, at most. And that’s all it took. The matched pair of Neumann M149 microphones used for this recording were able to clearly pick up on the tonal impact of this seemingly minor change, and the skilled ears behind the console noticed it right away. The offending chair was disposed of, recording continued, and the breathtaking result is free from any incongruity – a suitable exclamation point at the end of a long musical career for the Cypress String Quartet. Everything matters. It’s a concept also applicable to the reproduction of music. And used wisely – no magic rocks or clocks need apply – I think it makes a whole lot of sense. What’s the weakest link in a good number of audio chains these days? Why does a lot of vintage gear sound so damn good, despite often using “inferior” tech compared to the latest and greatest hardware? Speakers and headphones are a different story, but when it comes to a disc spinner, DAC, or other source component, my fingers tend to point straight to the power supply as the answer to both of those questions. Armed with gobs of processing power and highly-advanced op-amps, it’s not all that hard to design a reasonably nice piece of source gear. It can be done at a modest price too. Often times this nets excellent specs and a feature list replete with terms like “ultra-low-jitter” and “DSD capable” – achievements that would have been considerably more expensive even five years ago. At the same time, there’s a distinct possibility that this affordable uber-device cut some corners in terms of power supply, perhaps even using the dreaded (for some) “wall wart”. What we end up with is something that can still satisfy for the price, yet has some untapped potential just waiting to be drawn out. Enter the Wyred 4 Sound PS-1. Wyred 4 Sound call their PS-1 a “modular” design, which is the exact reason I was drawn to it. That means far more usefulness than the vast majority of aftermarket power supplies. Over the years, I’ve spent a considerable amount of money on single-device-specific PSU upgrades from brands like TeraDak, Graham Slee, Teddy Pardo, Mojo Audio, Sbooster, and JKenny – all of which performed quite well for their respective prices. But once the device in question rotates out of the system, I no longer have any use for the PSU, and typically sell it at a substantial loss. Wyred 4 Sound’s PS-1 puts an end to the power supply rotation cycle. The device itself, at US$399, is essentially the platform on which a user builds. It’s a discrete linear power supply with a large R-core transformer and room for up to four separate cards – each with selectable output voltage. Choose between 5V, 9V, 12V, or 15V from each card. This covers most (if not quite all) of the equipment I’ve come across in recent years. Mix n’ match as needed to fit your particular system needs, or start with a single card and expand later as your setup grows more complex. Find yourself switching to a new device that needs 9V instead of 12V? Just change a jumper setting on the card. Simple. Standard cards are US$125 each and provide up to 1.2A. This modest current output tends to cover things like digital converters (e.g. Wyred 4 Sound’s own Remedy, Empirical Audio’s Offramp 5) as well as USB cleaners such as Wyred 4 Sound’s own Recovery. 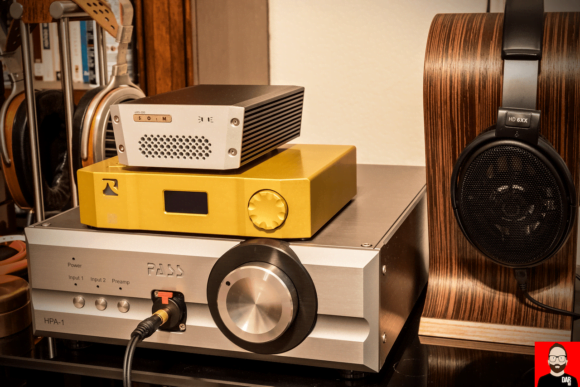 There are even a few all-in-one DAC/headphone amps like the Audinst DX-1 which will run quite happily from the standard card and will show significant gains – particularly on the headphone section. If one felt so inclined, other potential uses for the PS-1 would be to power external hard drives or various networking accessories. This would keep cheap, noisy wall-warts out of a system, though in my experience having a good power conditioner in the chain can be a more cost-effective solution. For hungrier devices, Wyred 4 Sound also offers a high-current module ($500) that does the same voltages but at up to 4A. 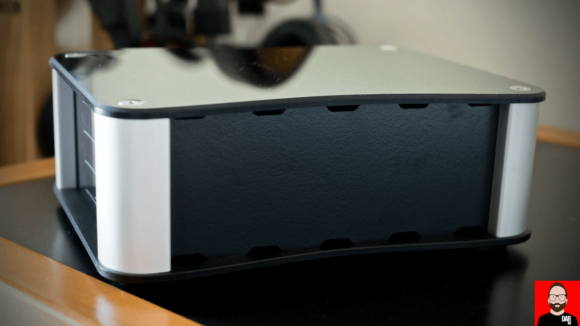 This opens the door to a plethora of DACs, music streamers, and even some headphone amplifiers. Now we’re talking. Listening. My primary testbed consisted of the fabulous little SOtM sMS-200 streamer, used as a Roon endpoint, with a Wyred 4 Sound Recovery sprucing up its already very good USB output. A PS-1 loaded with one standard card and one high-current module rounded out the transport trio. 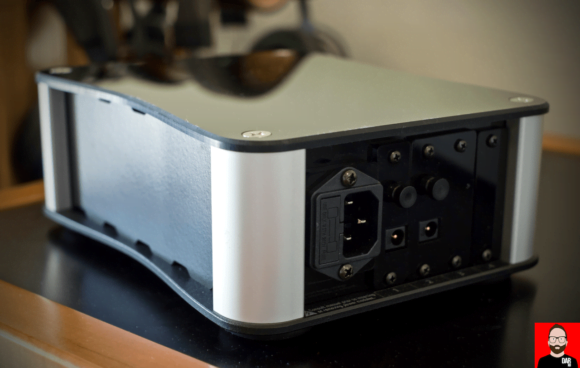 Digital audio signals traveled over USB to a Resonessence Labs Veritas DAC driving a Pass Labs HPA-1 headphone amplifier. 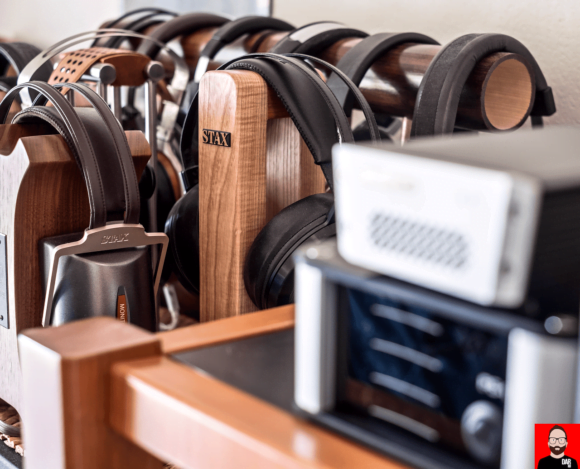 On headphone duties were a mixture of HiFiMAN HE1000, AKG K812, Enigmacoustics Dharma, and the venerable Sennheiser HD800, all of which the Pass amp drives with unwavering honesty. Connections were handled by Cabledyne Silver Reference whilst each device sipped balanced juice from an Equi=Core 1800 power conditioner – which just happens to be a pleasing aesthetic match for the PS-1. For grins, I also swapped in a B.M.C. UltraDAC which drives custom in-ear monitors directly. My current champion in that department is the ambitious Empire Ears Zeus XRA which is about as resolving a transducer as one will find anywhere. Bottom line – any improvements over the stock wall-wart power supplies, this system will definitely sniff out. Let me be clear before I go any further: I consider the sMS-200 a fine device all on its own. It’s a relatively cost-effective and hassle-free way of transforming any DAC into a Roon-ready networked device, and I heartily recommend it, even without upgrades. On stock power it stays pretty much neck-n-neck with the Sonore microRendu – a rival device which I also happily recommend. I do hear differences between them, and tend to prefer the SOtM more often than not, but that preference changes from one system to the next. Once linear power arrives to the party, both devices improve substantially, and my preference for the SOtM becomes more clear cut – but again, they both have merit. Adding PS-1 and Recovery to the sMS-200 brings it up to an altogether higher level. We’re talking bigger, bolder tone colors, more precise imaging, and a greater sense of heft down low. This means the Reference Recordings HRx release of Felix Hell’s Organ Sensation possesses greater pants-flapping authority. Silicon Tare, the latest EP from retro-synth mastermind Com Truise, is more ethereal and layered, and thus easier to get lost in. And the extremely technical metal on Obscura’s Akrøasis can be unraveled to a greater degree – their current drummer Sebastian Lanser (of Panzerballett fame) is among the most skilled percussionists of his generation, and the upgraded sMS-200 allows me to discern the intricacies of his performance more easily than in stock form. More typical audiophile material also sounds phenomenal on this setup. 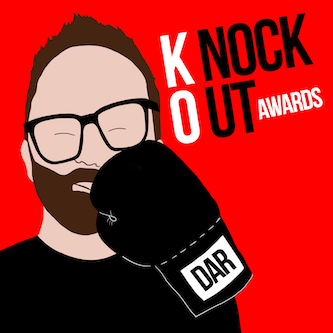 While certainly being cognisant of the potential for over-exposure, I still love me some Waltz for Debby, pretty much anything by Alison Krauss, select tracks from Livingston Taylor (some of his I can’t stomach), and yes – even the occasional Norah Jones. I know, I know…these types tend to sound impressive on even the most basic system, and I can see why it’s so tempting to play them to death at audio shows. They represent the “safe” approach to showing off audio gear. Still, there are worse offenders (Krall, “Hotel California”, and lots of white-dude blues) which are banned from my home outright, so I’m not completely ashamed of my choices here. I ran through my list of audiophile-approved tracks that I don’t hate (yet), and have to admit it all sounded amazing from a technical standpoint. Cymbals and brush work were particularly well represented, as were vocals of all types which came across as more lifelike and present than they did before the Wyred 4 Sound-centric upgrade. Listening to Norah or Livingston with the basic sMS-200, you’d never want for clarity and air, but once those Wyred 4 Sound components join the fun it becomes apparent just how much potential could be fulfilled. I find it interesting how that works – you don’t know what you’re missing until you hear something better. Moving on from those selections – which in a way almost seem more like “evaluation tools” than music at this point – I ventured into the decidedly non-audiophile-approved regions of my 4TB+ digital audio library. This is the real reason why I have all this audio equipment in the first place. The chugging, rhythmic complexity of the eponymous debut release from Animals As Leaders. The quirky turntablism of Kid Koala on Carpal Tunnel Syndrome. The psychedelic Khmer rock of Dengue Fever’s Venus On Earth. Idris Muhammad’s funk masterpiece Power of Soul. Esperanto by former Kraftwerk member Carl Bartos (operating here under the clever name Elektric Music). I Against I, showcasing Bad Brains at their punk-funk finest. Lazar Berman’s haunting performance of Janáček’s Piano Sonata 1.X.1905. I could go on and on, but hopefully you get the point here – this is just bunch of music that I love and want to play for my own enjoyment, regardless of whatever audiophile merits it may or may not possess. And guess what? Notwithstanding the widely varying sound quality of these different artists and albums, I nonetheless heard improvements when upgrading the sMS-200 with PS-1. These improvements were enough to justify the added cost despite the pedestrian quality on many of these releases. They may not be “reference” caliber like my earlier demo music, but that doesn’t stop them from showcasing sonic benefits in their own way. Fatigue is a big one for me. When a recording isn’t all that well done in the upper midrange and highs to begin with, it only takes a hint of added digital glare to impede the listening experience after just a short time. In such an instance, I prefer the stock form microRendu to the stock form sMS-200. The SOtM is a bit more lit up and revealing while Sonore’s widget ends up being a tad more forgiving – a good thing in some instances. With the PS-1 in place, the sMS-200 exposes more of music’s organic tone whilst maintaining its revealing nature. It’s a delicate balancing act whose accomplishments very clearly rest on the shoulders of this Wyred 4 Sound upgrade. Limitations. I’ve yet to encounter the perfect audio component – and the PS-1 doesn’t break that streak. Being fussy, one complaint relates to the amount of total available current and the way that the PS-1’s total current supply ceiling, approximately 4A to all modules, might limit its overall utility. Users can run up to four standard modules at 1.2A each. That’s great, but many devices demand more than that. The high-current module can provide up to 4A which should be plenty, but at that point the PS-1’s transformer is just about tapped out. That same 4A can be split in half between a pair of high current modules, or apportioned between one high-current and two standard cards – but in these cases, max draw on the high-current module is limited to 2A or less. In the configuration I use, with one of each type of module, the high-current card should not exceed 3A. You’ll likely will see where I’m going with this. It isn’t hard to come up with numerous theoretical system combinations that work just fine with the PS-1, but neither is it difficult to imagine some that won’t. For example, if I wanted to pair the sMS-200 with an m2tech Young DSD DAC, and use that to feed an Arcam rHead amplifier – I wouldn’t be able to power all three with the PS-1. Nor could I use a Squeezebox Touch plus a small DAC such as Arcam’s irDAC, while still having enough juice to power an Uptone Regen. Ultimately, the initial excitement about running 4 different devices from a PS-1 is tempered by the realization that only two, or maybe three, are likely to fit in a real-world system. Furthermore, in many instances, it’s tough to really know what the power requirements are for a given component. It’s just not something most companies care to list in detail. And even when they do, one can never be sure if that’s the normal operating draw or the absolute maximum you’ll ever see. I recently heard from a fellow HeadFi user who runs his sMS-200 with the Wyred PS-1 using the standard module. He claims to have no issues whatsoever, and I have no reason to doubt him. But I also suspect he’s using the SOtM in a very simplistic manner. If he connects a USB powered hard drive for direct playback in MPD mode, will he still have enough juice? 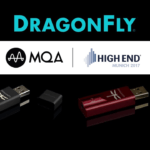 What about using a DAC that draws power from the 5V section at all times, rather than just for the initial handshake? And how about a USB powered DAC like the Audinst DX-1 I mentioned earlier? Using the high-current module, as recommended by Wyred 4 Sound themselves, gives us legroom to use the device to its fullest potential and not worry about potential quirks caused by inadequate current. I fully realize the R-core transformer – and probably the entire device for that matter – would require substantial enhancement in order to allow for more flexibility here. 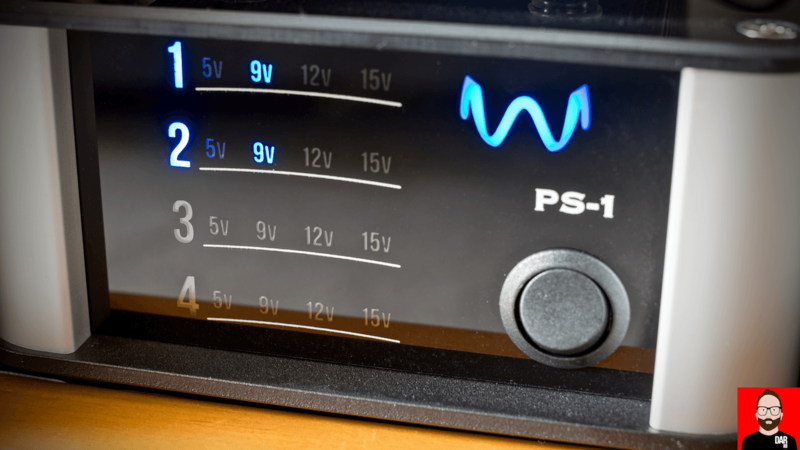 Wyred 4 Sound describes the PS-1 as “user-friendly, compact, and affordable” – likely the latter two attributes wouldn’t survive the ensuing changes were it to introduce a more robust PS-2 for those with more demanding power supply needs. My other concern – and not Wyred 4 Sound related – involves the unpredictability of power supply upgrades in general. The Arcam rHead is a perfect example. 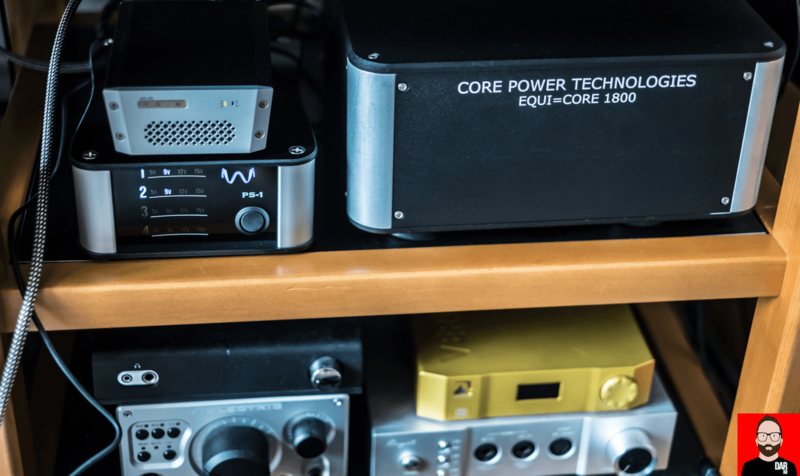 It’s my favorite headphone amp anywhere near its $599 asking price, and you’d think it would respond well to replacing its wall-wart with a nice linear PSU – as most gear seems to do. But you’d be wrong. No, the rHead isn’t really concerned with the quality of incoming juice thanks to its extensive internal filtration. This complaint certainly isn’t limited to the PS-1 alone, yet as something of a “universal” power supply, it seems more susceptible potential disappointment since you’ll be trying more devices. Overall, these niggles, whilst thoroughly explored, remain minor – not enough to impede my enthusiasm for the PS-1. As we shall see, going deeper into the numbers makes Wyred 4 Sound’s PS-1 a highly compelling proposition. Wrap-up. Let’s do a bit of math. The sMS-200 goes for US$450. Adding a Recovery for US$200 brings us to $650. That’s a great little combo and plenty of users would be happy to stop there. While the duo is indeed very satisfying, I do recognize its shortcomings compared to my more expensive solutions from B.M.C. and Aurender. Now let’s address that by adding the PS-1 for $399, a standard amp module for US$125, and a high-current module at US$500. That powers our SOtM and Recovery to the tune of US$1024, bringing the grand total to US$1674. Here comes the kicker: for that money, this combo easily plays on the same level as my over-twice-as-expensive Aurender X100L. And it keeps up with my B.M.C. Puremedia which requires well over thrice the souped-up sMS-200’s outlay. The feature sets these devices bring are all unique, so I won’t get into point by point comparisons other than to say the upgraded SOtM is not at all sonically embarrassed in this company. The takeaway here is that Wyred 4 Sound’s PS-1 turns this already competent network playback device and USB cleaner into something of a giant-slayer. There’ll be no play by play of how the PS-1 sounds compared to other aftermarket power supplies either. Frankly, that sounds about as exciting to read/write as a cable shootout. So you’ll have to just trust me when I reiterate my experience with most of the players in this segment, and when I say the PS-1 is right up there with the best of the breed. With its modular design, Wyred 4 Sound’s PS-1 gives up nothing to its specific-use competition, while taking a significant lead in versatility. I’ve seen a few PSUs out there with adjustable voltage, and even some with multiple outputs, but to my knowledge the PS-1’s feature set has never been done before. If we look where digital is now, and where it might be headed, I think some of us may need to adjust our attitudes about the lifespan of our gear. Rather than seeking a decade-long relationship with streamers and DACs – a sentiment which still exists for good speakers and amplifiers – it might be prudent to take an approach akin to smartphones and computers. In order to stay on the cutting edge, one must rotate gear every couple years. Keep it fresh by taking advantage of the rapid advancements in technology. Which is why I love seeing devices like the sMS-200 and the microRendu – they don’t break the bank and it’s far easier to flip one of those little guys on the used market than a vastly more expensive music server. The PS-1 on the other hand can remain a constant. It will stick with you as other gear is rotated in and out. It may very well be the last power supply upgrade you ever purchase. Your digital gear will come and go but the PS-1 will help bring out the full potential of each new piece – as well as any supporting re-clockers, USB scrubbers or other, possibly yet-to-be-determined gadgets. Because, as we’ve heard before, everything matters. Nice review. I am the guy from Head-Fi that’s using the sMS-200 with PS-1 (standard module). The higher current module may be overkill, unless like you say trying to power an external HD. That being said, I did test this briefly and it powered my drive just fine…though I only really use sMS-200 as roon endpoint. My guess is that unless you are trying to power an external HD, there would be no audible benefit with springing for the higher current module. In my system, the PS-1 also powers the Chord 2Qute in my system using a second standard module. My sentiments are much the same…digital gear will come and go, but the PS-1 will likely stay right where it is for many years. Thanks for chiming in here. I think using the standard module is a pretty safe bet for Roon mode, which is the only thing many people want out of the SOtM. That makes the PS-1 upgrade more affordable. Many of the virtues of the PS-1 also apply to the Uptone LPS-1 with it’s multiple voltage selections, being the poor mans Vinnie Rossi Mini power supply with added flexibility. Definitely interesting times for 3rd party power supplies. SOtM sMS-200 will accept a large voltage range of 6.5~ 14.5 Volt DC with the supplied wall wart being the nominal 9Volts. This is a great match for the W4S PS-1 because the standard 1.2 Amp module can be set to 9V if no usb storage attached or increased to 12V or 15V if needed for using usb storage…….I really don’t think the 4 Amp high current module is necessary in this instance thus saving $375. 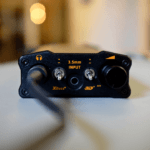 The Uptone LPS-1 is by all accounts an excellent supply for 3.3 V or 5 V or 7 Volts and is a good match at 7V for the sMS-200, but I would be concerned if you need to use the usb ports for external hard drives. Thanks for the review, it’s very timely as I’m shopping for an LPS to mate with my MyTek Brooklyn DAC (min 2.0A). I’ve always had great experiences with W4S hardware. Unfortunately, once I add a high-current module, the PS-1 enters Vinnie Rossi Mini (ultracap) territory (+$100). If I didn’t already have an Uptone LPS-1 (also ultracap) powering my µR, then the PS-1 would start to make some financial sense and I would be left to decide whether ultracap technology is worth the additional spend. This is a good point. I think the PS-1 really comes into its own when powering multiple devices. Running just your Brooklyn alone, you’ve got many compelling choices. If you wanted to add an sMS-200 (assuming Roon use with the standard amp card) plus a Wyred Recovery or a USB to SPDIF converter of choice (thus another standard amp card), the PS-1 could run everything. There aren’t many (or any?) others to choose from in this application. Besides the modular design are there any other reasons why I might choose the PS-1 over another similarly priced LPS? In other words am I trading sound quality for convenience? In my opinion it strikes perfect balance. I don’t feel as though I’m trading sound for convienience. Nor do I. That was something I really watched for during my evaluation – does this PSU have merit on its own, or does the utility come at a cost? I’m pretty confident it performs well in its class regardless of the modular aspect. We don’t consider any sacrifice is made (nor was it ever part of the design process) from the modular aspect versus, say, just powering one device. The PS-1 was developed from the ground up to effectively power multiple devices simultaneously, using a custom-made and highly robust R-core transformer. I might add that one of the many benefits of powering multiple devices from the PS-1 is they all will be tied to a common ground. I remember when I upgraded the SMPS that came with my SB Touch to a CIAudio LPS I didn’t notice that much difference (if any). I decided to keep it just for the peace of mind and to avoid any potential signal ”pollution” that could be generated by the SMPS. That was then and this now and PSUs and streamers have evolved but I’m still wary of spending as much on a PSU as I did on the streamer itself to only gain peace of mind or the ”I think I hear a difference” type of improvement. Another question I ask myself is if the microRendu or SMS-200 really deserve better PSUs then shouldn’t they be sold with ones designed specifically for those devices? Why should we need to guess which PSU is best for our device. If the designers are capable of designing a good product they should be able design the optimal PSU for that product and offer it at a befitting price. Sonore *do* offer an optimised bespoke power supply: https://darko.audio/2016/10/sonore-at-rmaf-2016-talisker-taste-on-a-teachers-budget/ …but if they were to offer only that, potential customers would then ask “Why do we need such a fancy power supply? Why can’t we buy it without?”. Additional benefit not mentioned is all devices live on the same ground using this configuration. Running roon core on a nuc with data sitting on a synology nas. Ah I soon as I read the title, I could hear the notes to Everything counts playing in my head! John, do you plan on doing a separate review specifically for the sMS-200? Thanks for the review on the PS-1, it seems an interesting product. The sMS-200 on the other hand… If it’s like their sMS-100 with dedicated power supply for 900Euros which became quickly obsolete, then no thank you. I was stuck with it after only one year and selling it used was not possible as it was EOL. It was too expensive to just switch after only 1 year. Even with all the added enhacements it still sounded worse than an Aurender X100L. I tried the sMS-100 briefly and wasn’t impressed. The one I heard had the matching battery PSU and some kind of noise isolation gizmo from Empirical Audio… maybe the Short Block? I don’t recall. Either way, I agree, it was pretty underwhelming overall. The sMS-200 is significantly better even in stock form, and scales very well from there. There’s a reason it has become so popular while the 100 never really took off. Quick update – for anyone interested in using a PS-1 with the SOtM sMS-200, I can now definitively confirm that the Standard amp card is perfectly fine for general Roon use. Got my hands on a device which displays the total load, and the sMS-200 rarely exceeds 0.6 amps for Roon duty. Much of the time it hovers around 0.3A-0.4A with very occasional spikes. It only hits 1A while booting, just for a brief couple of seconds. If you’re plugging in USB powered hard drives, then it will probably require the High Current module. For Roon use, the Standard is perfectly acceptable.